SABANA GRANDE, Puerto Rico (CNS) — A Puerto Rican bishop celebrating an outdoor Mass in Sabana Grande welcomed members of an unrecognized Marian organization, but remained silent about the group’s ecclesial status. 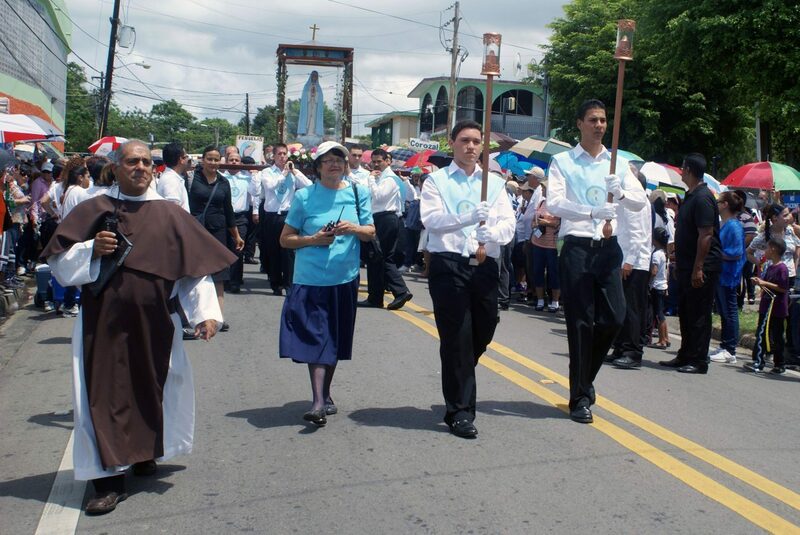 Bishop Alvaro Corrada del Rio of Mayaguez came to the southwestern municipality May 22, after skipping his traditional May 15 Mass in the city for the feast of St. Isidore the Farmer, the town’s patron saint. “We joyfully receive also the great number of devotees of the Virgin of the Rosary of the Spring with their directors,” he said to loud cheers during his welcome message at the overflowing town square. With that introduction, he went on to say the Mass without any further reference to the devotee association or its annual procession, scheduled for that day. “Today is the solemnity of the Most Holy Trinity of the one and triune God. … I offer, my brothers and sisters, this Holy Mass for the sanctification of all of you and of the people of the Diocese of Mayaguez,” the bishop said. The group, Our Lady of the Rosary of the Spring Devotee Association, chose May 22 as the date for its observance of the 62nd anniversary of the end of Mary’s 33 supposed alleged apparitions at a spring-puddle in Sabana Grande in 1953. The group maintains that several students from a nearby grade school reported seeing “a beautiful young lady” floating on a cloud above a spring that provided water to the school. Two church investigations have deemed the apparitions to be “lacking credibility.” The diocese has advised the faithful to avoid affiliating with the association. Tensions rose recently after the organization issued a news release saying Bishop Corrada was “inviting all devotees of the Virgin of the Spring to a Mass that will make history in Puerto Rico,” referring to the group’s anniversary. During Bishop Corrada’s procession to the altar, he stopped at the front row of seats. There he greeted association officials, specifically embracing its president, Ricardo Ramos Pesquera, and Juan Angel Collado Pinto, who as a child was one of those who claimed to see Mary. Before the Mass, large groups of devotee volunteers arrived wearing different uniforms. Many were seen among the crowd communicating via hand-held radios, as if coordinating the event. During the collection and Communion, the volunteers escorted lay ministers on their duties. After the Mass, several ministers told Catholic News Service it was unclear why they were accompanied.